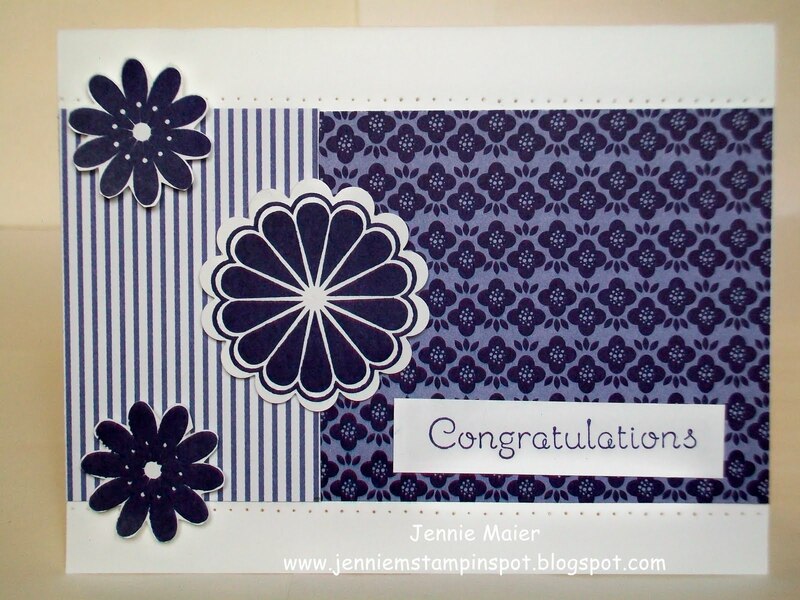 I used the Clean and Simple Stamping FTL#146 here for this graduation card. The recipient's college colors will be purple and white so I used the soon to retire Concord Crush DSP Pack In-Color with the retiring Petal Pizzazz stamp set. The base is Whisper White card stock and then I added two papers from the DSP Pack In-Color. I stamped the flowers from Petal Pizzazz in Concord Crush and cut out the two smaller ones. I used the 1 3/4 inch XL Scallop Circle punch on the middle flower.All three flowers were popped up with Stampin' dimensionals. I stamped Congratulations from Occasional Quotes in Concord too. 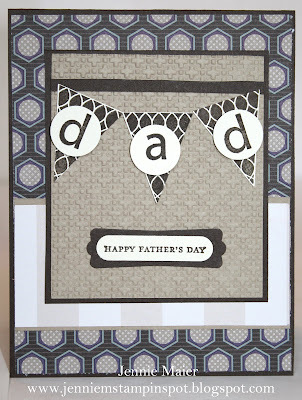 Finally, I used the Paper Piercing tool to add rows of holes to the top and bottom of the card. I made this card for the Stamping 411 Sketch#209 here. I used the retiring set, Priceless with the retiring DSP, Sunny Garden. 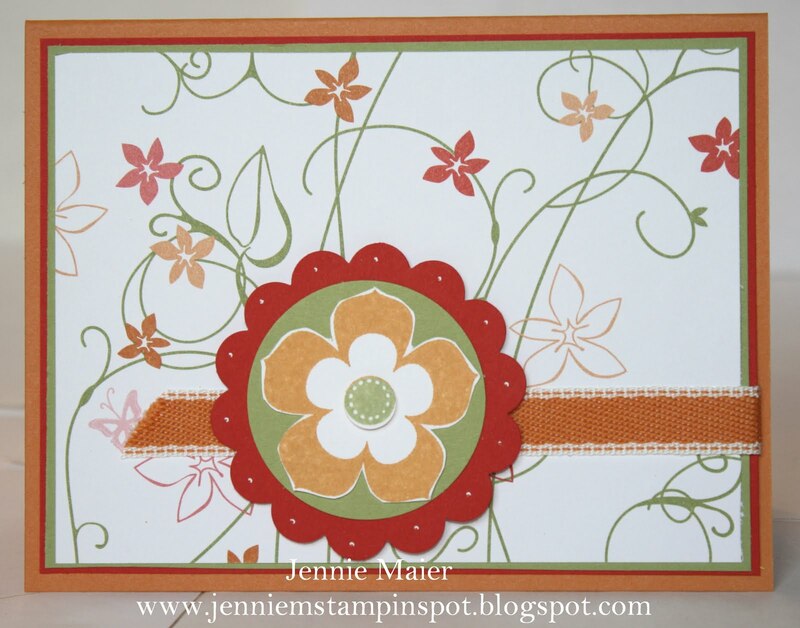 The base is Poppy Parade card stock and then I added two papers from the Sunny Garden DSP. I used the stamps from Priceless and Daffodil Delight, Peach Parfait, Pear Pizzazz and Poppy Parade inks to stamp the panel on the left side. I stamped So Kind in Poppy and the flowers in Daffodil, Pear and Peach. I punched out the Daffodil one with the 1/2 inch Circle punch and popped it up with a Stampin' dimensional. I punched out the Whisper White circle with the 2 1/2 inch XL Circle punch and layered it onto a Poppy Parade piece punched with the 2 3/8 inch XL Scallop Circle punch. I used my White Gel pen to add some dots to the scallop. Finally, I popped up the Poppy scallop with Stampin' dimensionals. This bright card uses the Create with Connie and Mary Color Challenge #156 here. The colors to use are Tangerine Tango, Tempting Turquoise and Old Olive. The base is Tangerine Tango card stock and then I added some Old Olive card stock and Tangerine Tango and Old Olive DSP from the Patterns DSP Brights Stack. I colored the flowers from Eastern Blooms with my Old Olive, Tempting Turquoise and Tangerine Tango Stampin' Write Markers. I added Glimmer Brads to the center of each flower. I popped up that panel with Stampin' dimensionals. I ran a piece of Tangerine Tango thru the Dotted Scallop Ribbon Border punch and adhered it behind the Old Olive DSP. 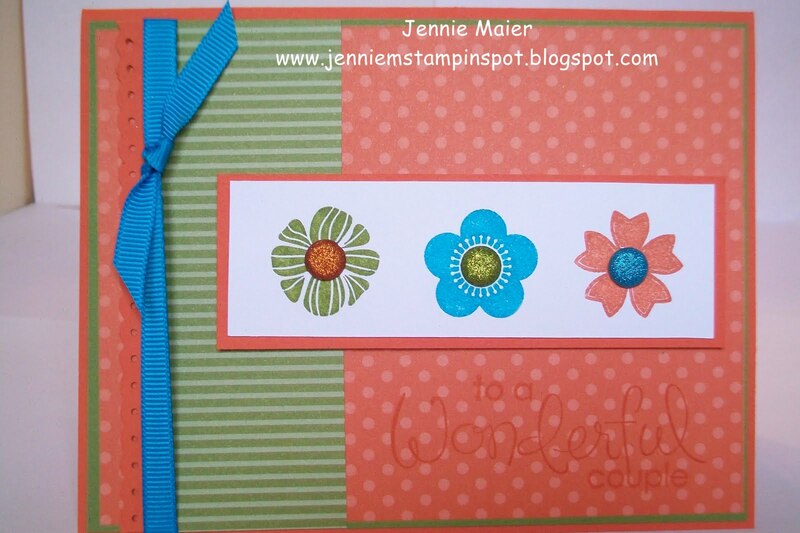 I stamped "to a Wonderful couple" from Wonderful Favorites in Tangerine Tango on top of the DSP. Finally, a piece of 1/4 inch Tempting Turquoise grosgrain finishes it off. This patriotic card was made for three challenges. First, the PPA#99-CAS-Elements of Style-Stars here. Second, the Splitcoast Color Combination 328 here, to use Cherry Cobbler, Crumb Cake and Night of Navy. And finally, the Splitcoast Sketch#338 here. I started with a base of Crumb Cake card stock. Then, using the Stamp-a-ma-jig and the Solid Stripe stamp, I inked it up with Cherry Cobbler and stamped it on Cherry Cobbler card stock. I used the soon to retire Star punch to punch out a Cherry Cobbler, Crumb Cake and Night of Navy star. I adhered the stars to the Whisper White circle and ran it all thru the Big Shot with the Perfect Polka-dots textured impressions embossing folder. I then matted the circle with some Night of Navy. I stamped the star from Pennant Parade in Cherry Cobbler, punched it out with the Itty Bitty Shapes punches pack and matted it with a Navy circle punched with the 1/2 inch Circle punch. 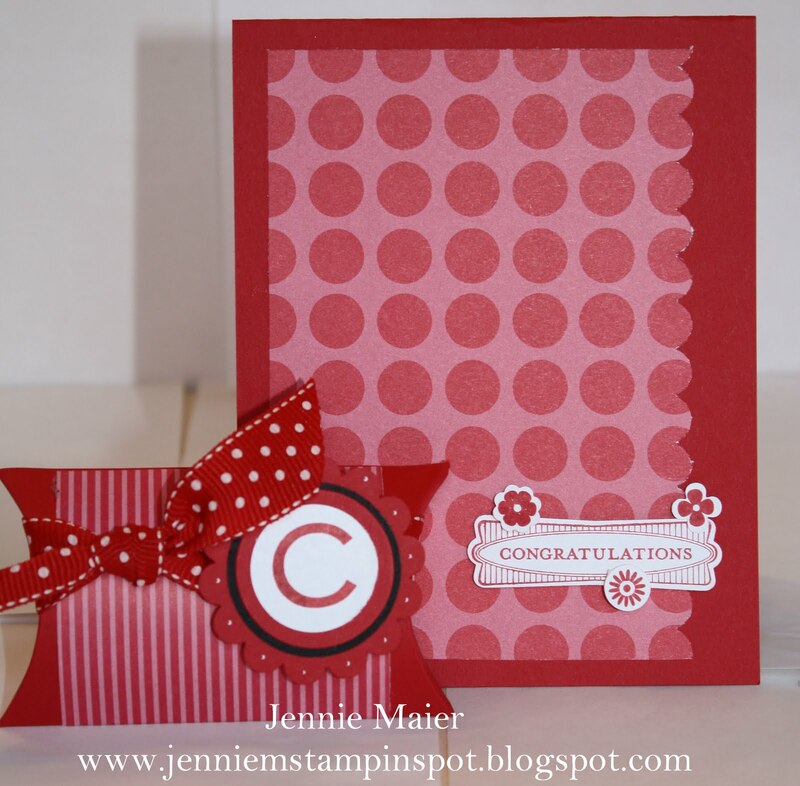 I then popped up the circle with a Stampin dimensional. Finally, I stamped thank you from Short and Sweet in Cherry Cobbler on Crumb Cake and punched it out with the Word Window punch. This card uses a retiring stamp from the Fun & Fast Notes stamp set but new papers from the Pocketful of Posies Designer Series Papers. I also used the MojoMonday Sketch#196 here. The base is Rich Razzleberry and I added some Razzleberry DSP's from Pocketful of Posies. I inked up the cake stamp from Fun & Fast Notes in Basic Black and colored it in with my Crumb Cake, Old Olive and Rich Razzleberry Stampin' Write markers. I used the Coluzzle to cut the ovals from Whisper White and Rich Razzleberry and popped them up with Stampin' dimensionals. The square is more Pocketful of Posies DSP and matted with Crumb Cake. The 1 1/4 inch Circle punch was used on more DSP and the 1 3/4 inch Circle punch on some Rich Razzleberry. Finally, some 5/8 inch Old Olive grosgrain ribbon that is retiring finishes it off. I'm on a mission to use products that will retire soon and this card does just that! 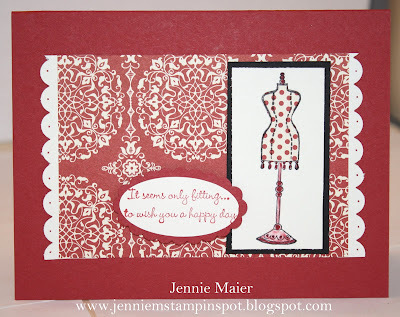 I used the On A Pedestal stamp set with the DSP Pack In-Color. I also used the Stamping 411 Sketch#208 here. 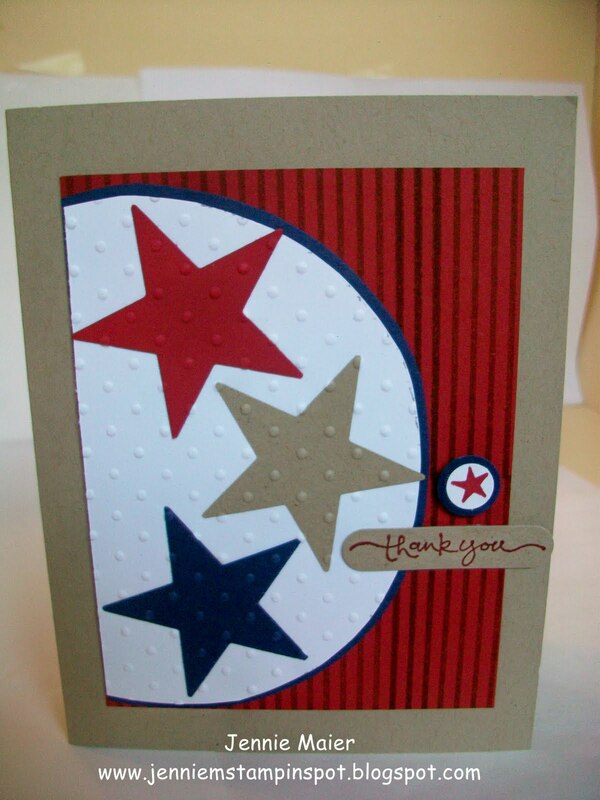 The base is Poppy Parade card stock and I added two of the patterns from the DSP Pack In-Color. I stamped the pedestal from On A Pedestal in Poppy Parade and used the So Saffron and Baha Breeze Stampin' Write markers on the cake portion. 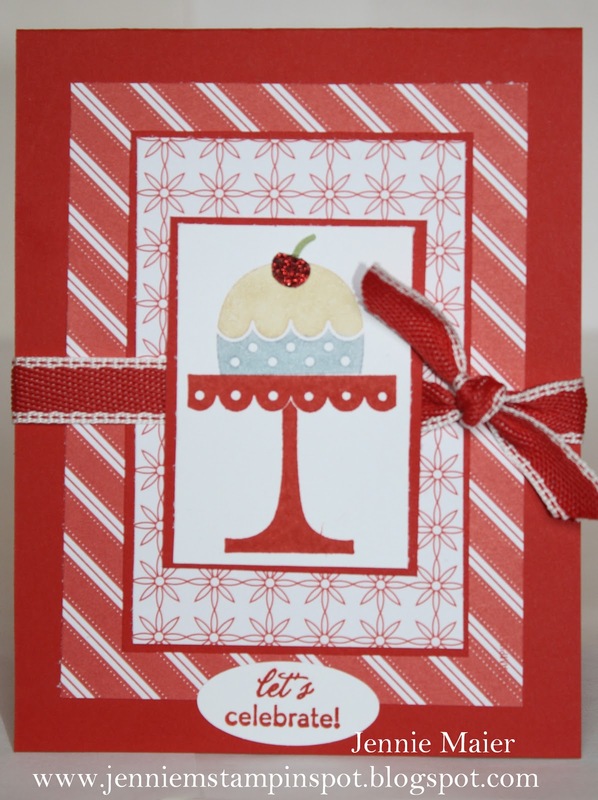 I used the Build a Cupcake XL Punch to punch out the cherry with some Pear Pizzazz and Red Glimmer paper. 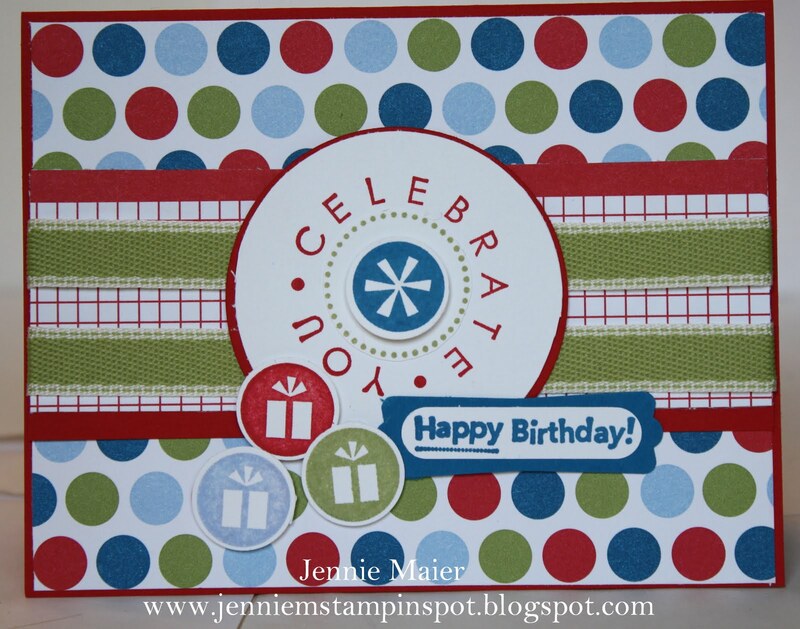 I stamped let's celebrate from On Your Birthday in Poppy Parade and punched it out with the 1 3/8 by 5/8 inch Large Oval punch. Finally, some 1/2 inch Poppy Parade stitched-poly ribbon finishes it off. Goodbye to Love Letter DSP! I'm SO going to miss the retiring Love Letter DSP! So I used it for this card with the Artistic Etchings stamp set and the Create with Connie and Mary Sketch#155 here. The base is Riding Hood Red card stock. I ran a piece of the DSP thru the Big Shot with the Top Note die. I punched out the black scallop with the XL 2 3/8 inch Scallop Circle punch. I used the XL 2 1/2 inch Circle punch on the black polka-dotted DSP. 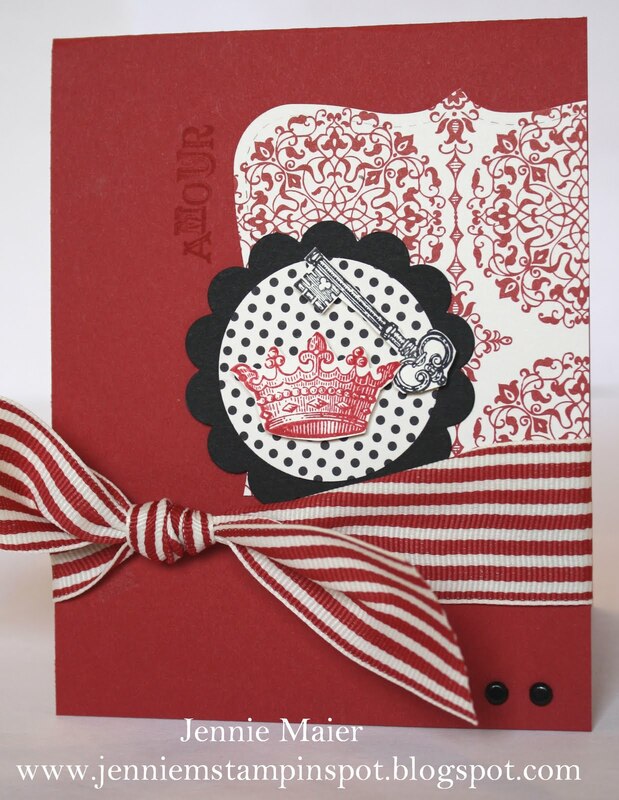 I stamped the crown in Riding Hood Red on Very Vanilla and the key in Basic Black on Very Vanilla, cut both out and popped them up with Stampin' dimensionals. Amour was stamped in Riding Hood Red too. I used two Basic Black brads on the bottom right hand side of the card. Finally, some 1 1/4 inch retired Riding Hood Red striped grosgrain finishes it off. This card showcases some new In-Colors: Pool Party, Lucky Limeade and Island Indigo. It also used the retiring stamp set, All Holidays and retiring punch, Spiral Border punch. I used the Clean and Simple Stamping FTL#145 here. The base is Crumb Cake card stock. Then I added some Whisper White. I ran pieces of Pool Party, Lucky Limeade and Island Indigo thru the Big Shot with the Square Lattice textured impressions embossing folder. I stamped the greeting from All Holidays in Lucky Limeade. I ran a piece of Crumb Cake thru the Spiral Border punch and popped up both pieces with Stampin' dimensionals. 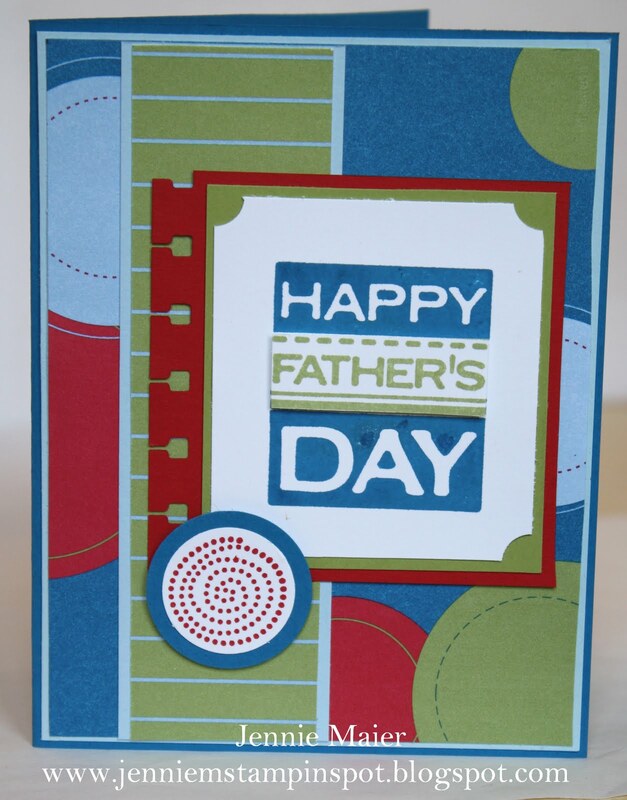 I used the PPA#98 here to make this Father's Day card. It also uses a number of retiring things: All Holidays stamp set, Spiral Border punch and Celebrations DSP. The base is Pacific Point card stock and then I added some Bashful Blue and two patterned papers from Celebrations DSP. I stamped Happy Father's Day from All Holidays twice, once in Pacific Point and again in Pear Pizazz, cutting out the Pear part and popping it up with Stampin' dimensionals. I used the Small Ticket Corner punch on the corners of the Whisper White piece and the Spiral Border punch on the Real Red piece. I stamped the swirl from Trendy Trees in Real Red, punched it out with the 3/4 inch Circle punch and layered it onto a Pacific Point piece punched with the 1 inch Circle punch, popping that up with Stampin' dimensionals. 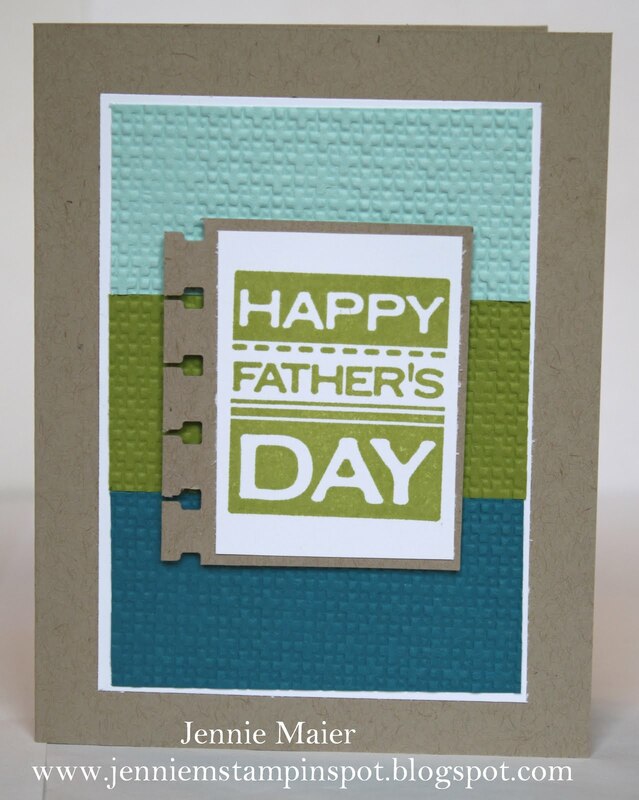 This is a Father's Day card I made using some Sneak Peek items. I used the Pocketful of Posies DSP and the Pennant Parade stamp set. The sketch I used is the Splitcoast Sketch#337 here. The base is Early Espresso card stock and I added some papers from the Pocketful of Posies DSP. I ran a piece of Crumb Cake thru the Big Shot with the Square Lattice textured impressions embossing folder. I stamped one of the pennants from Pennant Parade in Early Espresso and used the XL Petite Pennants Punch to punch them out. I stamped Happy Father's Day from Teeny Tiny Wishes in Early Espresso on Very Vanilla and punched it out with the Word Window punch. That was layered on to an Early Espresso piece punched with the Modern Label punch. I used a retired alphabet set, Short Order Alphabet, to stamp the letters in Early Espresso and punch them out with the 3/4 inch Circle punch. The circles were popped up with Stampin' dimensionals. Finally, I hung the pennants from a sliver of Early Espresso. 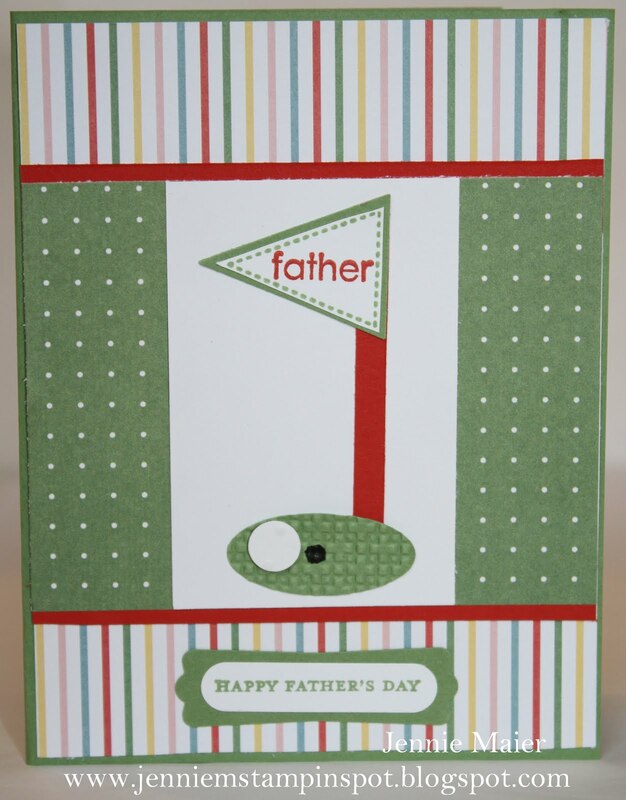 Here's a Father's Day card using Pennant Parade and Just Add Cake DSP. The uses for this stamp set are endless! I started with a base of Wild Wasabi and added two patterns from the Just Add Cake DSP. I stamped the dotted pennant from Pennant Parade in Wild Wasabi and added a Wasabi piece that I punched with the Petite Pennant Punch. I added "father" from Wonderful Favorites in Poppy Parade. A piece of Poppy Parade created the flag pole. I ran some Wild Wasabi thru the Big Shot with the Square Lattice embossing folder and punched it out with the soon to retire 1 3/8 by 5/8 inch Large Oval punch. I added a hole with my Basic Black Stampin Write marker. 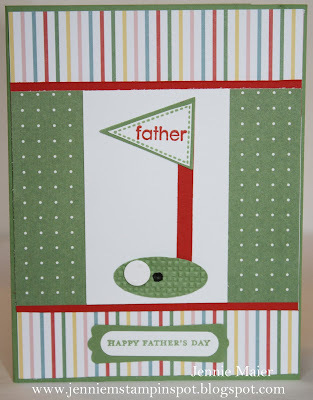 I ran some Whisper White thru the Big Shot with the Perfect Polka Dot embossing folder and punched out a "golf ball" with the 1/2 inch Circle punch, popping up the ball with a Stampin' dimensional. The greeting from Teeny Tiny Wishes was stamped in Wild Wasabi, punched out with the Word Window punch and layered onto a Wild Wasabi piece punched with the Modern Label punch. I made this masculine birthday card for the MojoMonday Sketch#195 here. I used some products that will retire June 30th-the Party Hearty stamp set and Celebrations DSP. Real Red card stock is the base then I added two patterns from the Celebrations DSP. I stamped celebrate you from Party Hearty three times, once in Real Red and cut it out with the Coluzzle circle cutter. I punched out a Real Red piece with the 2 1/2 inch XL Circle punch. Then I stamped it again in Pear Pizzazz and cut out the dotted circle. Finally, in Pacific Point, punched it out with the 3/4 inch Circle punch, and popped it up with a Stampin' dimensional. 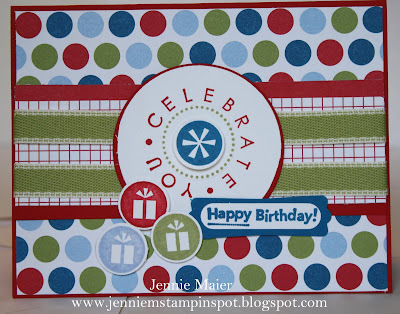 I stamped the present three times in Real Red, Bashful Blue and Pear Pizzazz, punched them out with the 3/4 inch Circle punch and popped them up with Stampin' dimensionals. Happy Birthday from On Your Birthday was stamped in Pacific Point, punched out with the Word Window punch and layered onto a Pacific Point piece punched with the Modern Label punch. Finally, some 1/2 inch Pear Pizzazz stitched-poly ribbon finishes it off. 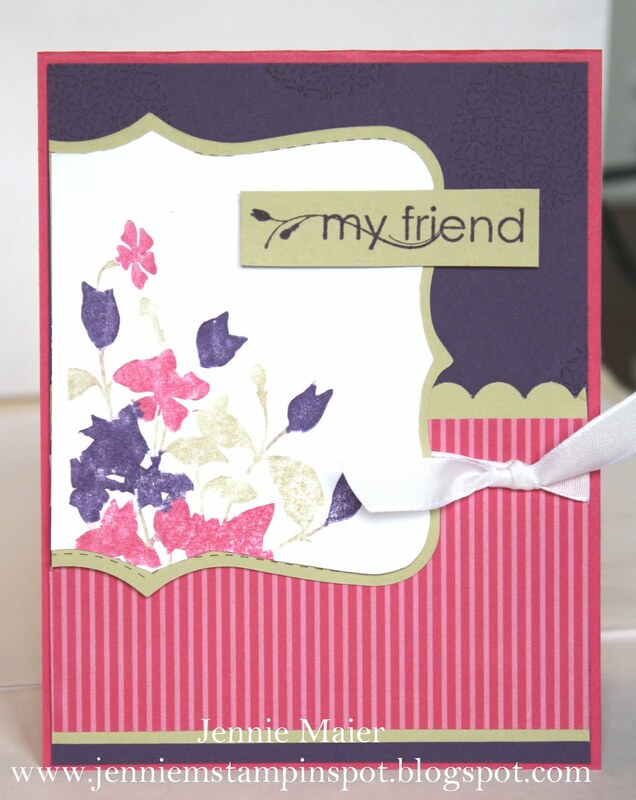 I used the soon to retire, Petal Pizzazz, on this card along with the Sunny Garden DSP. The Stamping 411 Sketch#207 here was my guide. The base is Peach Parfait and then I added some Poppy Parade and Pear Pizzazz before the Sunny Garden DSP. I punched out a Poppy piece with the 2 3/8 inch XL Scallop Circle punch and a Pear Pizzazz piece with the 1 3/4 inch XL Circle punch. I stamped the flower from Petal Pizzazz twice, first in Peach Parfait and cut it out, then in Pear Pizzazz and punched the center out with the Itty Bitty Shapes Punches pack. I added some dots to the scallop with the White Gel pen. The entire scalloped piece was popped up with Stampin' dimensionals. Finally, some 1/2 inch Peach Parfait stitched-poly finishes it off. I made this graduation card with the Clean and Simple Stamping FTL#144 here. It's for a high school graduate who is heading to the University of Wisconsin-Madison and their colors are red and white. The base is Real Red and I added some Celebrations DSP. I ran the edge of the DSP thru the Scallop Edge Border punch. I stamped congratulations from Perfect Punches in Real Red and punched it out with the Modern Label punch. 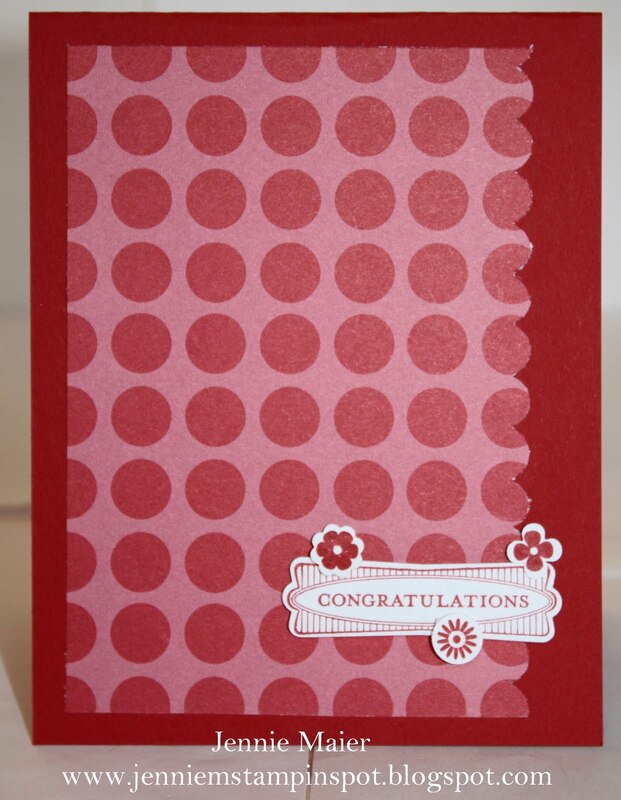 I stamped the flowers from Printed Petals in Real Red and punched them out with the Itty Bitty Shapes Punches pack. 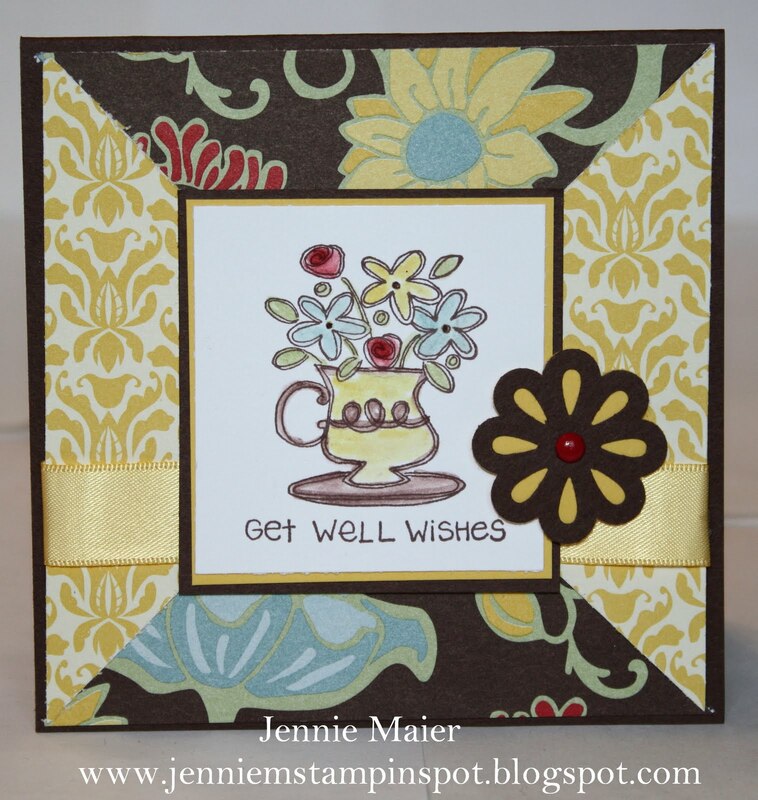 I popped the sentiment and flowers all up with Stampin' dimensionals. Here's a picture of the card and pillow box. I filled it with chocolates. Here's what I used to make the pillow box. I'm still in pink mode so I used the Splitcoast Color Challenge#326 here along with the MojoMonday Sketch#194 here. The colors are Melon Mambo, Pink Pirouette and Regal Rose. My base is Melon Mambo and then I added some Regal Rose card stock. I added strips of the Flirtatious Specialty DSP and Melon Mambo and Regal Rose DSP from the Patterns DSP Brights Stack. I ran a piece of the Pink Pirouette thru the Big Shot with the Perfect Polka Dots textured impressions embossing folder. I used the 1 3/8 inch Circle punch on some Melon Mambo to create the scallops under the Pink Pirouette piece. I stamped the image from Delicate Doilies in Melon Mambo and trimmed it down. I used the 1 3/4 inch XL Circle punch for the piece of Regal Rose. I added those pieces to a Melon Mambo laser-cut doily from the Flirtatious Specialty DSP, popping it up with Stampin' dimensionals. I used the 1 /4 inch Square punch to create the little pennants on Pink Pirouette pieces. Finally, some 3/8 inch Whisper White taffeta ribbon finishes it off. I made this card using the new set, My Friend for two challenges. First, the Create with Connie and Mary Color Challenge#154 here. The colors to use are Elegant Eggplant, Melon Mambo and River Rock. And second, for the PPA#97-What's Your Signature Style-here. I'm not exactly sure what my style is but I tend to gravitate towards bright and bold looks or crisp and clean?!? My favorite color collection is definitely the Brights Collection! 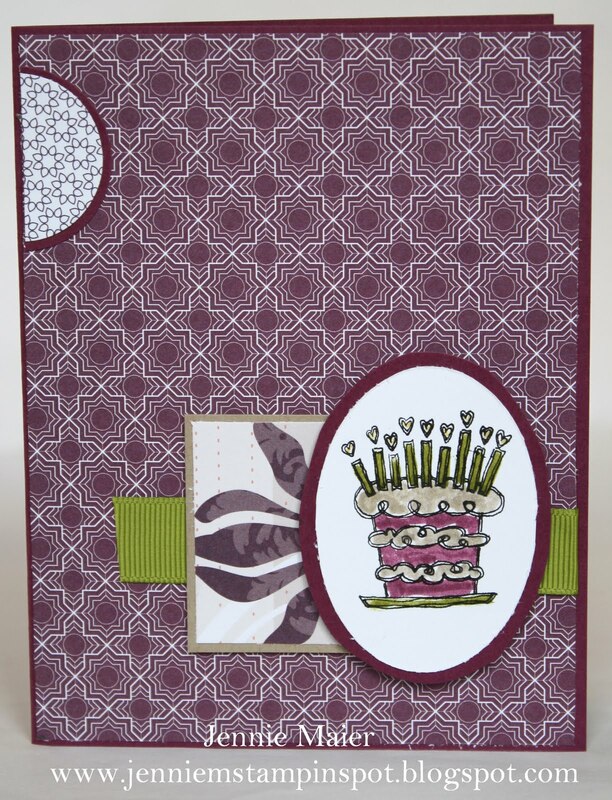 I started with a base of Melon Mambo card stock and added some Elegant Eggplant. I ran some River Rock and Whisper White thru the Big Shot with the Top Note die and trimmed down the White piece. I colored in the big flowers stamp from My Friend with my Elegant Eggplant, Melon Mambo and River Rock Stampin' Write markers. It's hard to see from this picture but I stamped the circle image from My Friend in Elegant Eggplant on the Eggplant card stock. 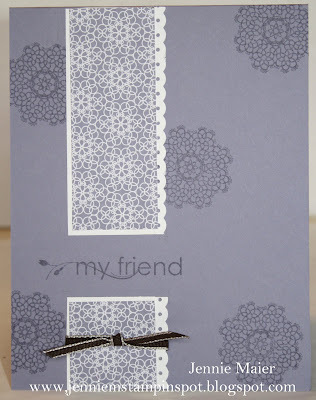 Then I stamped "my friend" in Eggplant on River Rock and popped it up with Stampin' dimensionals. I ran a strip of River Rock thru the Scallop Edge Border punch, Finally, some 3/ 8 inch Whisper White taffeta ribbon finishes it off. I used a new In-Color, Wisteria Wonder on this card. 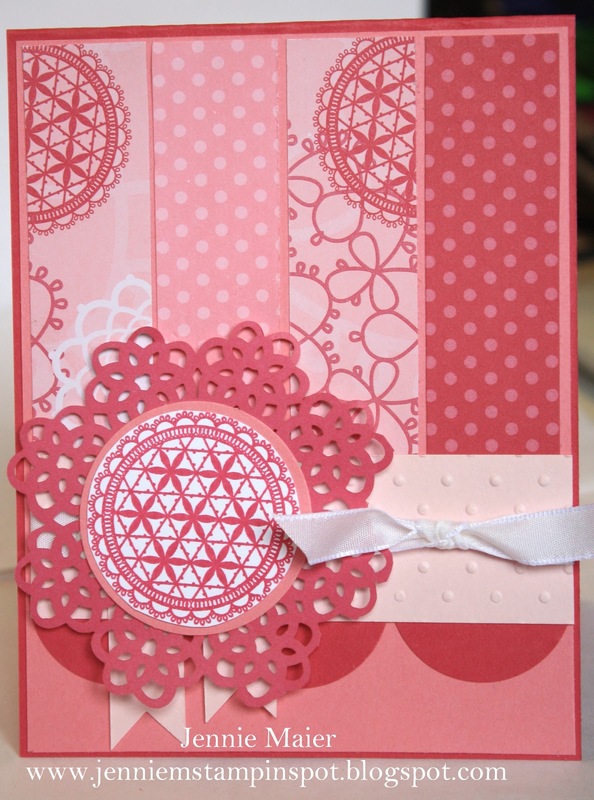 I also used new stamp sets, My Friend and Delicate Doilies, and new DSP, Flirtatious Specialty DSP. And this card was made for the Splitcoast Sketch#336 here. The base is Wisteria Wonder card stock and then I used a stamp from Delicate Doilies and Wisteria Wonder Classic ink to create the background. I added some Flirtatious Specialty DSP and matted it with Whisper White. I ran an edge of the Whisper White thru the Dotted Ribbon Scallop Border Punch. I stamped " my friend" from the stamp set My Friend in Wisteria Wonder. Finally, some 1/8 inch Early Espresso taffeta finishes it off. I got my pre-order today and couldn't wait to play with it and share this card I made using new goodies and the Stamping 411 Sketch#206 here. The base is Wild Wasabi card stock and that's one of the many colors in the new, Just Add Cake DSP. I ran a piece of Wasabi thru the Dotted Scallop Ribbon Border Punch. The stamps are from the new Pennant Parade stamp set which coordinates perfectly with the Petite Pennants Punch. I stamped them in Peach Parfait, Wild Wasabi and Poppy Parade and punched them out with the punch. I threaded some Early Espresso/White Baker's Twine thru the pennants and popped them up with Stampin' dimensionals. I used the Wild Wasabi Stampin' Emboss Powder on the "wish big" sentiment and Peach Parfait on the star. I cut that piece down a bit and layered it onto a Wasabi piece punched with the Modern Label punch. Finally, a Real Red Designer Button finishes it off. This is for the Clean & Simple FTL#143 here. 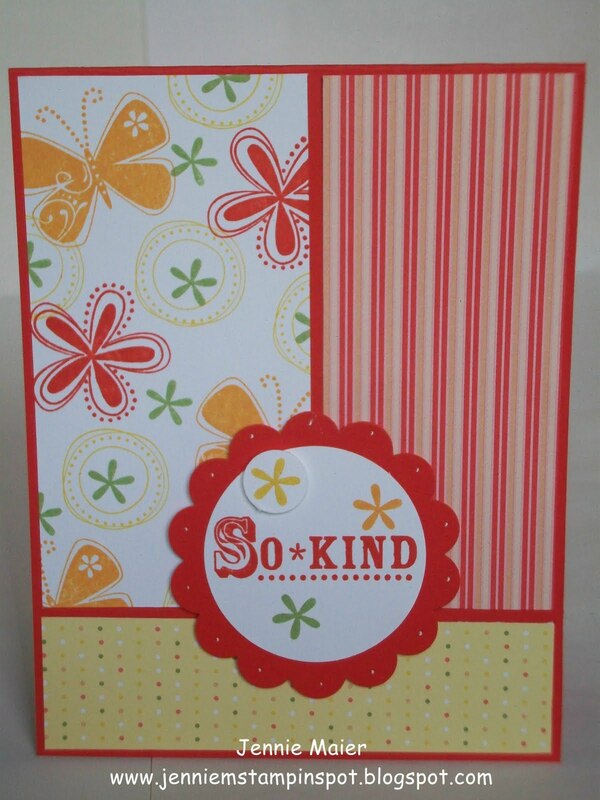 The base is Riding Hood Red card stock and I added some Love Letter DSP. I ran some Very Vanilla thru the Scallop Edge Border punch and used my Riding Hood Red Stampin' Write Marker for the dots on the edge. I stamped the dress form image from Chic Boutique in Basic Black on Very Vanilla then again on some DSP and paper pieced that together. The Riding Hood Red Stampin' Write marker was used to color in the rest of the form. I stamped the greeting in Riding Hood Red on Very Vanilla and punched it out with the 1 3/4 inch by 7/8 inch Large Oval punch. Finally, some Riding Hood Red was punched out with the XL Scallop Oval punch and popped up with Stampin' dimensionals. I made this card for my dad's birthday and two challenges. First, PPA#96 here, and second, Create with Connie and Mary Sketch Challenge#153 here. The PPA Challenge was a color challenge-Cherry Cobbler, More Mustard and Night of Navy-and to make a masculine card. The base is Crumb Cake card stock. Then I ran Cherry Cobbler, More Mustard and Night of Navy card stock thru the Big Shot with the Square Lattice textured impressions embossing folder. I stamped the image from Party Hearty(retiring on June 30th) in Cherry Cobbler. Then in Night of Navy I stamped the birthday image and used my 3/4 inch Circle punch to punch it out and pop it up with a Stampin' dimensional. Finally, some Cherry Cobbler Baker's Twine finishes it off. I made this card with the MojoMonday Sketch#193 here. I used the retiring stamp set Fun and Fast Notes with some Greenhouse Gala DSP, also to retire. The base is Chocolate Chip card stock and then I added the Greenhouse Gala DSP. I stamped the image from Fun and Fast Notes in Chocolate Chip and used my blender pens and Chocolate Chip, Daffodil Delight, Baha Breeze, Real Red and Pear Pizzazz Classic pads to color it in. 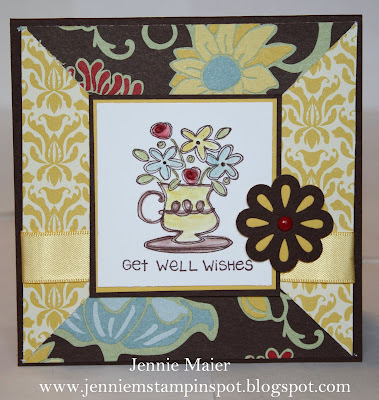 I used the Blossom Bouquet Triple Layer Punch on some Chocolate Chip and Daffodil Delight card stock and added a Real Red brad to the center, popping it up with Stampin' dimensionals. Finally, some 5/8 inch Daffodil Delight Satin ribbon finishes it off. Now thru June 30th you can purchase stamp sets, accessories and Definitely Decorative items that will be retiring. Some accessories are up to 40% off! All items on the "accessories" list are available only while supplies last, so get them fast! Just click on my "Shop Now" link to the right to shop, or on the links below to see the lists. Or you can email me at anytime! The Last Chance Stamp and Accessory Lists are here! 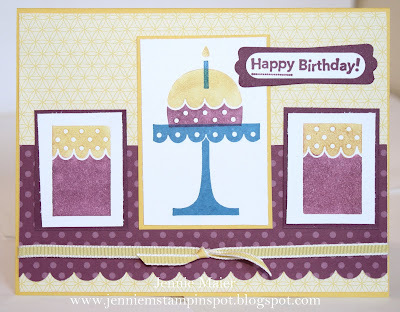 This card uses the stamp set, On a Pedestal, the Sunny Garden DSP, and the Modern Label Punch, all to retire on June 30th-see my next post for details. I made this for the Stamping 411 Sketch#205 here, and with the Splitcoast Color Combination#335 here. The colors to uses are Rich Razzleberry, Pacific Point and Daffodil Delight. The base is Daffodil Delight card stock and I added some DSP from the Sunny Garden DSP and some Razzleberry DSP from the Patterns DSP Brights Stack. I ran the Razzleberry DSP thru the Scallop Edge Border Punch. I colored in the stamps from On a Pedestal with my Daffodil Delight, Pacific Point and Rich Razzleberry Stampin' Write Markers. 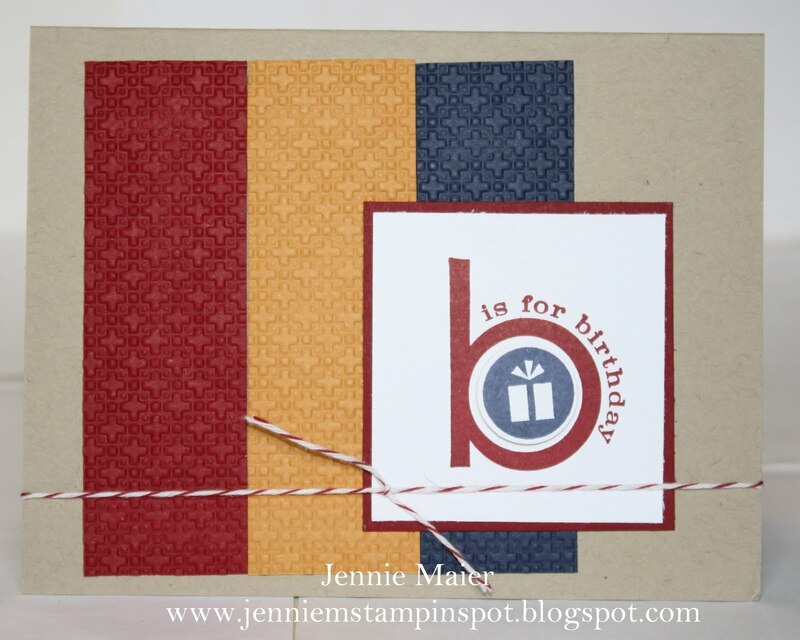 Happy Birthday from On Your Birthday was stamped in Rich Razzleberry, punched out with the Word Window Punch and layered on to a Razzleberry piece punched with the Modern Label Punch. Finally, some 1/8 inch Daffodil Delight taffeta ribbon finishes it off.